Anyway, I got to wondering whether the lack of travel in my early childhood - I first went abroad (by car) at 13 and didn't step on a plane till I was 15 - made me the traveller I am or if it is more innate. I hope the latter is true because I was watching Marcel and Lots on the plane on Saturday morning. The weather was perfect - clear skies with a postcard view of Denmark from the sky. Despite having been on literally hundreds of planes I still hang out the window in wonder at the beauty of it all - knowing how long I had waited for this view as a child. 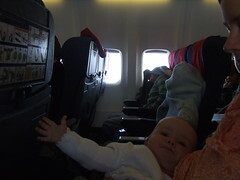 My kids on the other hand sat with jumpers over their faces trying to sleep away what they see as another boring run of the mill flight because they too have been on hundreds of planes, but they started flying at 15 weeks, not 15 years, so never knew what it was to wait to fly. I hope that despite their lack of awe, they will want to travel the world while they can rather than sit in an office. I guess their enjoyment of our little missed flight hiccup in Stansted gives me hope.